Taking it Apart . . .
With the shoring in place it was time to remove the cracked retaining wall. Although the building was never in any danger, caution is of course advised any time one works beneath concrete and masonry that isn't fully supported from below. Rather than break the retaining wall away, it was saw cut and taken out in sections in order to limit the vibrations sledge hammers or a jack hammer would otherwise create. The stair was further stabilized from above by tying the bottom of the landing to the needle shoring beams with a a length of heavy chain snugged up with a come along. 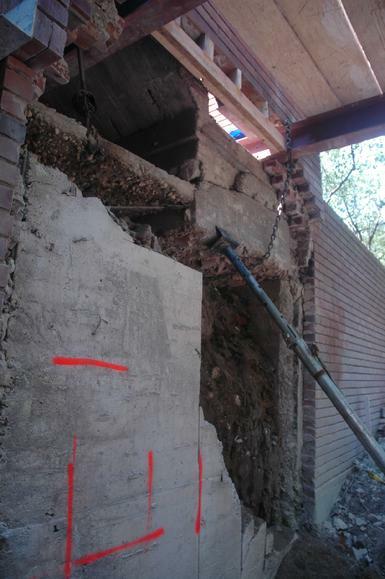 With the necessary shoring in place, cutting and removal of the damaged concrete wall was quickly completed. 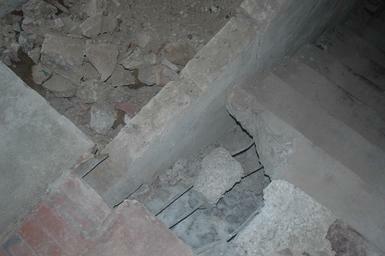 Once the old wall was gone, necessary excavation was likewise quickly completed. The new structural retaining wall is in place and reinforced. While there is still some work necessary at the top of wall in this photo, the roof stairs are also solidly supported (there is a new pier behind the wall that isn't visible in the photo running from the footing to the bottom of the landing). Although drainage will be addressed on the drive above to limit the development of any hydraulic pressure on the face of the new wall (which, the theory goes, was largely responsible for the damage to the old wall), through wall relief was nevertheless also provided. With the additional of some minor work at the top, this wall is ready for re-installation of the face brick. 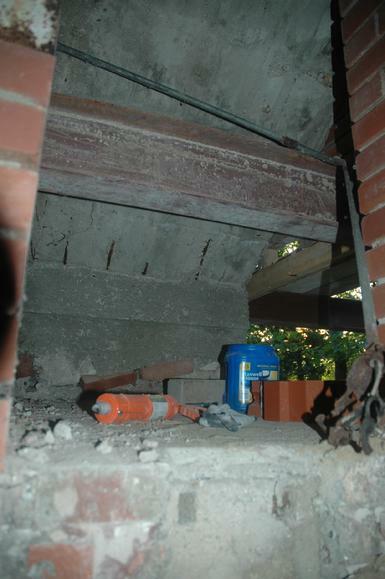 Once the brick is in place and the mortar has taken a full set, the needle shoring will be removed. 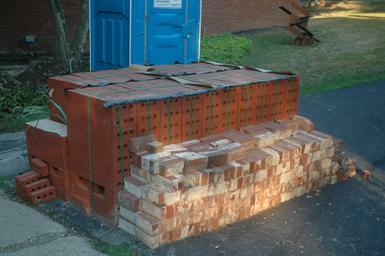 While new matching brick is available, much of the old brick cleaned easily and was salvageable. New brick will be concentrated in below grade installations and the old brick removed during demolition will be used where brick is visible. The stairs from the drive down to the ravine had shifted badly from their intended position and are set for removal and replacement. While some effort was made by the general labor to begin their removal, they proved to be far more massive and more heavily reinforced than anticipated. Until the masonry work on the retaining wall is complete there is concern about excessive vibration. That, coupled with the unexpectedly formidable nature of the stairs themselves, led to the decision to leave them in place until the jackhammer is on site to remove the driveway. The wall on the left (North) in this photo serves as a retaining wall and as backup to the brick facing adjacent to the stairs. Although it isn't displaced, it is far too slender, and it is badly cracked and damaged. 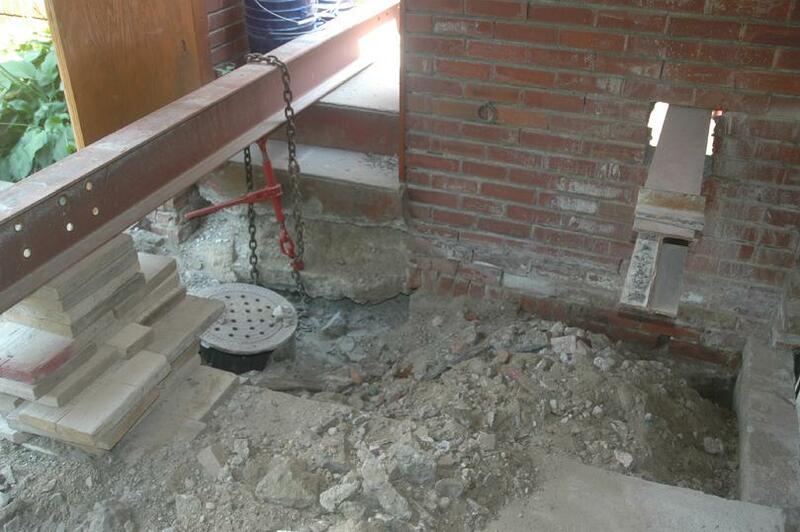 It will be removed and reconstructed with proper thickness and reinforcement along with the stair. 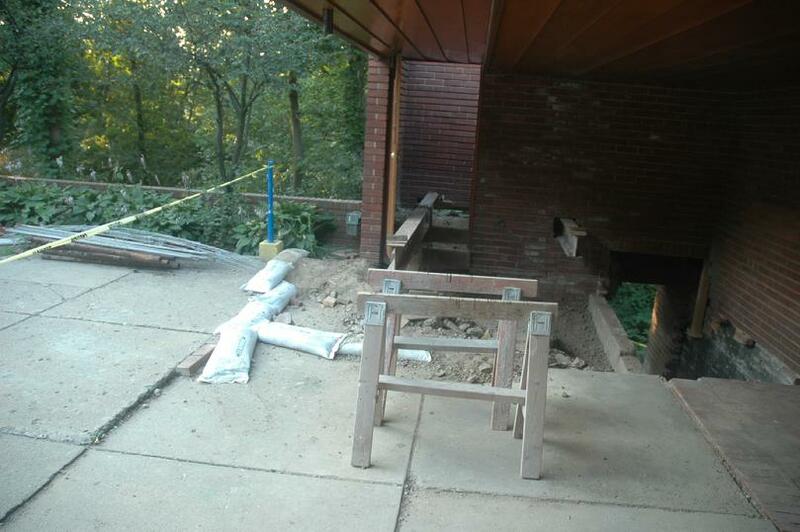 The space beneath the stairs to the roof will be backfilled when the retaining wall work is complete. Presuming the brick masonry is complete as anticipated over the next few days (the weather is cooperating, and while the brick work isn't particularly difficult, it is a fussy sort of detail kind of work), the next major step will be removal of the stair, the adjacent wall, and the concrete paving in this area. 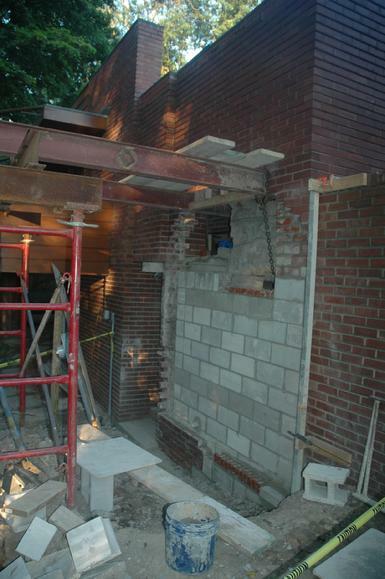 The jackhammer is scheduled to be on-site in the next few days so hopefully the brick work continues as scheduled. Demolition should be completed in the next week, after which the ravine stair and adjacent retaining wall construction can proceed.